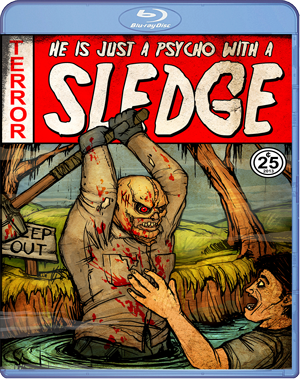 ‘Sledge’, the “all new American horror icon”, comes to BluRay and DVD and is now available for pre-order. What started as a messy camping trip in the woods has turned into an independent film worthy of posterity. Own a piece of history by pre-ordering the DVD or Blu-Ray today! DVD artwork has not been finalized, but this is the Blu-Ray as it will be the day it shows up in a blood soaked package by some guy who looks a bit off. In addition, one pre-ordered copy will contain a Golden ticket which will be an all expenses paid (bring your sleeping bag) trip to LA for the filming of ‘Sledged’ and join the cast and crew for the sequel.